Kite flying is a wonderful experience for kids (and big people too)! It is an incredible feeling to be holding onto a kite string and feeling the pull of the wind as the kite soars high above. In our home school activities this week, we created and flew these wonderful kites that are so very simple to make. I was inspired by some lovely kites I saw on Rhythm of the Home and adapted them to suit the challenge of crafting with three young preschoolers. Preparing the materials in advance is the winning factor in a successful crafting session with 3 under 5 years of age. For each child cut 2 40cm lengths of string and place in a zip lock bag. Wind the rest of the string around the 15cm stick or tube and place in the bag, too. Place the crepe paper strips into the zip lock bag. Fold the sheet of paper in half, long sides together. Along the top short end and the bottom short end, from the outside edge, measure and mark 10cm. Along the long side, from the top, measure and mark 10cm. Using a ruler, draw a line from the top end mark to the side mark. Then a line from the side mark down to the bottom end mark. Open the kite out and fold along the 10cm mark back towards the middle fold, on both sides. Place the prepared kites and crayons/markers/paints on a table and have the children decorate their kites. Once children have decorated their kites, tape the skewers along the folds at the 10cm mark. Reinforce the kite corners where the string will be attached, with tape. Using a hole punch, punch each corner of your kite. Tie the 40cm string through the holes and tie together at the ends. Tie the end of the string wrapped around the stick to the 40cm pieces. 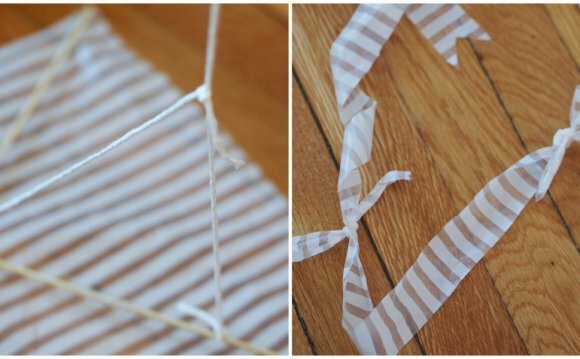 Staple the crepe paper strips to the base of the kite to create a tail. Fine motor skills. Cutting, sticking, colouring, grasping the string. Gross Motor skills. Running to give the kite some ‘lift’. Language development. Labelling parts of the kite: string, tail.